Anna Hughes rode 4000 miles around the coast of the UK on her tod, and then wrote the book. Tonight I went along to hear her talk about it, as she visits Bristol on her Land’s End to John o’ Groats book tour of Great Britain. I love living in Bristol. One such reason is the frequency of adventure related events that I hear about. First Ranulph Fiennes (I was lured along on the pretence that I was going to meet a hot film star), and then the inspiring Tom Allen (Janupar – the tear inducing, hope giving, awe-inspiring, makes-you-want-to-go-out-and-buy-a-camcorder documentary). After Tom it was Sean Conway, almost now a household name, with his strong beard; like a roaring fire, and today – Anna Hughes. Who is Anna Hughes? I hear you ask. I cannot answer this question in too much detail, for she did not give a huge amount away about herself. But she did nevertheless speak succinctly and engagingly about her ’round Britain’ bike adventure, which after all, was the point. When I went to see Conway talk about his ‘Length of Britain Triathlon’, I was tickled by his sense of humour and honesty of his pre-adventure days, depressed and prepared to swap his business for a quid. I felt like I really wanted him to succeed (and just look at him now finding his beard). Anna headed straight into planning the adventure, and as such I find myself intrigued – what truly inspired this solo trip? I also find myself proud of and inspired by a woman willing to undertake a solo long journey, and also envious, for my lack of being able to go it alone holds me back a great deal. It’s something I’d love to crack one day. 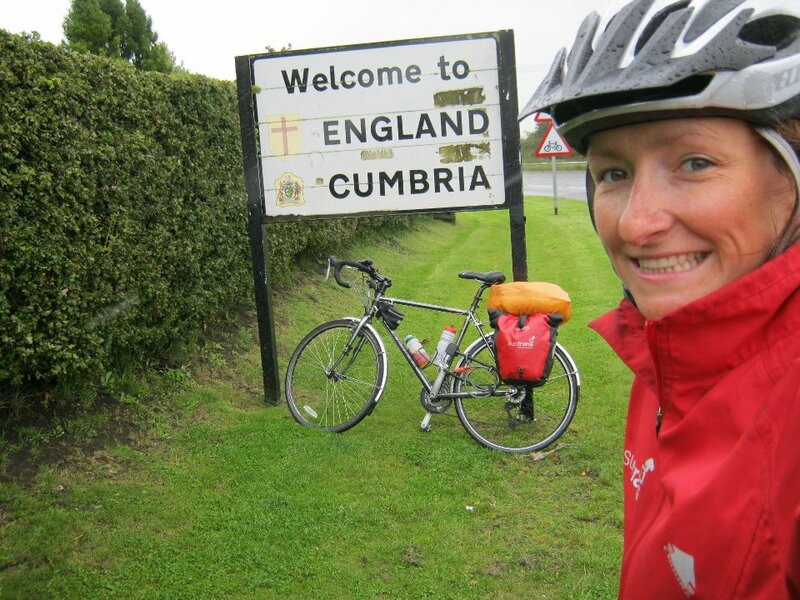 LeJog was a path too well trodden for London-based Anna. 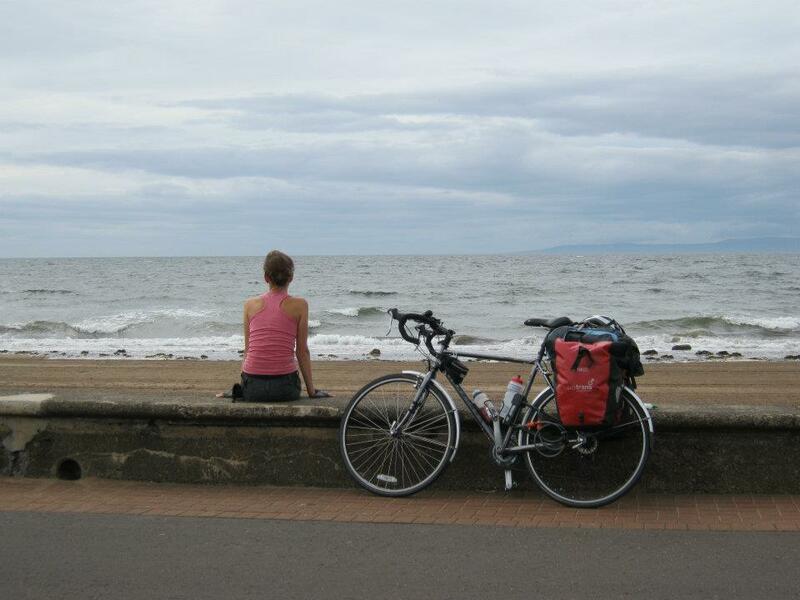 She wanted to do something different, and so she put her two Sustrans panniers on her tourer, and headed on her 4000 mile journey, that would have her finish the trip in Iran (should she cycle directly east from London, which of course, she wouldn’t because she’d get wet). She would follow the coast around the edge of Great Britain instead. ‘I’d reached the day when I’d run out of excuses and my dreams had turned into plans’. Anna spent 10 weeks on the road. She became the fittest ‘she’d ever been’. She met people along the way, some who rode with her. In Exter she had 20-something riders accompany her! (She beat the roadies up the hill with her panniers.) She stayed in people’s houses, ate lots of fish and chips. Had only one puncture. Suffered achilles tendonitis, stuck to the sea, encountered a sand dune in Wales (in a hurricane), and on her first day – fell in to a big patch of stinging nettles, the day culminating in tears and doubt. And yet, here she is, in Roll for the Soul, Bristol’s best Bike cafe, freshly pressed book in-hand, on her LeJog book tour of the UK. Smile on face, tales to tell. Having had a few hours to absorb Anna’s talk this evening, I’ve gone on my own journey (albeit not a 4000 mile one). Initially I felt a little frustrated not to have learned a bit more about Anna, nor teeter on the edge-of-my-seat (Tom Allen being escorted across Syria by armed guards on his cycle around the world comes to mind!) and yet, here I am, completely missing the point. Anna’s book isn’t about drama. I think it’s about the joy of how simple it can be to connect to the world, truly feel a sense of freedom and go on a journey that elicits self-discovery. To let senses muddle into each other, days spent smelling and hearing new noises and experiencing emotions (the happy ones, and the trickier ones) and breathing hard; getting fitter. Seeing new things and not knowing what is around the very next literal corner. And maybe even learning not to worry about it. I feel inspired, not by adrenalin-fuelled ideas, but by the reality that all this is really quite accessible. And that’s a wonderful thing. Looking forward to reading my newly signed copy, and finding out if I’m half way right. ‘I alone knew what (riding my bike) had meant, what strength and courage it had taken, but also how simple it had really been’. Anna’s book Eat, Sleep, Cycle is available now. Check out the FB page here.